Isadora Kosofsky (b. 1993) is a documentary photographer based in Los Angeles. She received the 2012 Inge Morath Award from the Magnum Foundation. She was chosen as participant in the 2014 Joop Swart Masterclass of World Press Photo. She recently received a 2015 Flash Forward Award from the Magenta Foundation and a 2015 Commended Award from the Ian Parry Scholarship. Her projects have been featured in TIME, Le Monde, Slate, The London Sunday Times, VICE, Mashable, The Huffington Post and Photo District News, among others. Isadora is currently working on multiple long-term projects including series focusing on a love triangle between seniors and the romantic relationships of developmentally disabled adults. Isadora and I recently discussed her series, Vinny and David, a project that she has devoted three and a half years to. The poignant images comprising the series follow the lives of two brothers who were involved in the criminal justice system in New Mexico. Zora J Murff: How did you become interested in photography, and what is your background? Isadora Kosofsky: When I was about nine, my grandmother and I watched Antonioni’s film “Blow Up” about a fashion photographer who is unfulfilled photographing models and decides to roam the streets in search of a meaningful subject. This photographer-protagonist particularly captivated me. When my grandmother passed away four years later, I asked my family for a camera. I found solace in photography as a way to alleviate loneliness. ZJM: Can you tell me a bit about the series? Why did you want to focus on juveniles in the justice system, and why this particular family? IK: During my early teens, I had a group of friends for whom delinquency resulted in police intervention. Some had been in juvenile detention, while others were on probation. We would meet at a shopping mall, and they would tell me their experiences with the juvenile justice system. I became particularly close to one male, and we began to spend time together outside our social group. Unfortunately, he was arrested, and I lost contact. I began to envision new projects and wrote to correctional facilities. After three years of submitting requests, at the age of 18, I was granted permission to photograph in a few domestic juvenile detention facilities. One evening, in the booking section of a juvenile detention center in Albuquerque, I saw Vinny and felt an immediate connection. Once Vinny arrived in his unit and sat down in front of the television, I approached him, and he confided his story to me, speaking of love for his mother and older brother. Vinny spoke extensively about his relationship with his older brother David, particularly talking about wanting his brother’s attention. After speaking to Vinny, I was taken aback by his wisdom and maturity. Later, I approached Vinny’s mom in Juvenile Court, and a few days later (while Vinny was still in detention) I went to Eve’s apartment. Vinny’s brother opened the door, but immediately shut it, telling me I wasn’t allowed inside. Though I am the same age, David assumed I was a social worker and was worried that I could be someone who could cause instability for the family. However, David’s response did not inhibit me from returning to the apartment. What I learned about Vinny and David’s brotherly relationship intrigued me, and I knew that in order to document Vinny’s life, I had to include David. ZJM: What did you want to accomplish with your series, and did your goals change over time? IK: My initial motivation was to produce a humanistic documentation of incarcerated youth. Yet, over time I realized that this held a limited scope. Through documenting one family, I began to uncover the interwoven chaos of love, loss, betrayal and abandonment that lives beneath the surface of incarceration. 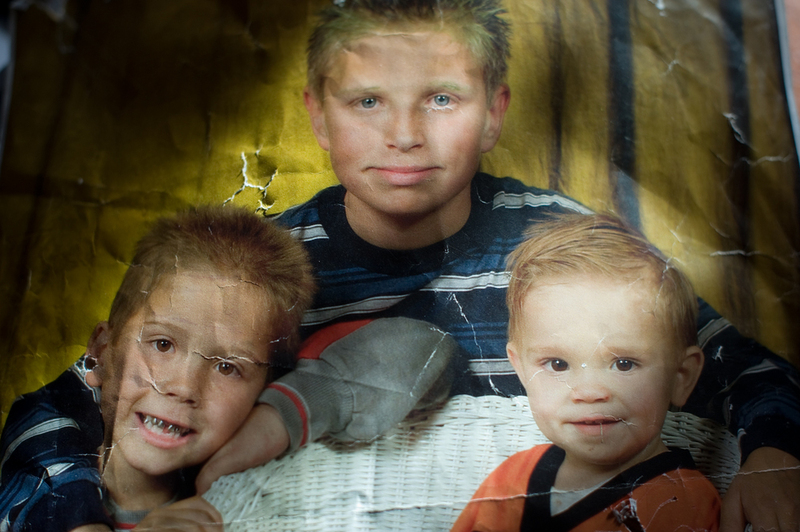 My drive to document this particular family was initially a curiosity about them, particularly about Vinny and David, and I’ve continued because of a deep felt connection to them. ZJM: When working on such an intimate series, questions of access come to mind. ZJM: There are a lot of very intimate and emotionally driven moments in your photographs. How did it feel to be in and then photograph these moments? Were there every any times when you stopped yourself because you felt like you may be divulging too much information? IK: My close bonds with those I photograph allows them to be vulnerable, and that connection also allows me to be vulnerable. Ideally, I spend an extended period of time with the subject until they stop altering their behavior due to the presence of the camera. I take a “fly on the wall” approach to photography in order to capture intimate moments. When in highly emotional situations, the camera sometimes acts as a protective buffer against my own personal emotional reaction. Sometimes, it is not until I look at the image when editing that I feel the impact of capturing that moment. Photography is collaboration between photographer and subjects, so I am always sensitive to the subjects’ desire to withhold certain information. I’ve noticed, too, that when you form relationships with your subjects, you unconsciously hide aspects to keep your idealism about them intact. ZJM: How did your relationship to the family evolve over time? Are you still in contact with them? IK: The relationship became closer as I was there to bear witness to their struggles over time. I still have close contact with them and speak to at least one family member daily. ZJM: Photographing kids can often be contentious. Have there ever been any averse reactions to your work? If so, how do you feel about them? IK: I haven’t received adverse reactions from the youths. The response has been positive, for I believe they sense that the images are not vanity shots, but photographs of life in all its rawness. When I’ve watched my subjects look at the images, they usually state that the work enables them, or their family members, to understand them better. I once asked Vinny if he thought that the work was true to his experience, and he responded yes. ZJM: Do you think photographers are capable of facilitating change, and do you think documentary photography plays the same role in today’s society? IK: Yes. Every documentary photographer wants his or her images to repair the world. Ever since I shot my first picture, I have been guilty of this idealism. I do strongly feel that a form of change occurs every time a viewer internalizes poignant images. ZJM: What are your thoughts on the increase in citizen journalism via smartphones and social media? IK: The increase in citizen journalism doesn’t decrease the need for photo documentarians. When I was fourteen, I met a photographer and told him that my goal was to be a photojournalist, and he said that I was too late and that profession would soon be obsolete. I couldn’t disagree with that statement more now than ever. It is in this increase of smartphone and social media that society needs individuals whose lives are devoted to humanistic work. A saturated culture needs documentary work produced for compassionate, intimate purposes to outweigh the daily outpouring of snapshots. ZJM: What did you take away from the images you made of Vinny and David? IK: I am in every photograph that I’ve taken. Every photo essay is a means to better understand my past and present existence. Though I’m not an art photographer who manipulates a shot to express my story, my life’s trajectory, whether literally or metaphorically, manifests in every documentary project. I am drawn to the people that I shoot because they reflect some aspect of me or those in my personal life. My photographs are a response to a love-loss paradox that has plagued my life. Through my work, I probe all my fears, vulnerabilities and desires. Peering at one of my images at an exhibition recently, it felt more accurate as a self-reflection than looking in the mirror. IK: I have expanded my work to now include video, I am developing multimedia short films, and I anticipate a return to the criminal justice system for a new major project this year. ZJM: Thank you for your time, Isadora. It’s been a pleasure. IK: Thank you, Zora. I look forward to watching Strange Fire Collective grow. To view more of Isadora's work, please visit her website.